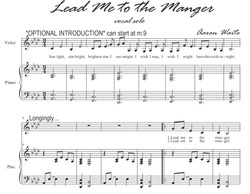 (2006) This is a contemporary Christian-type Christmas song that expresses a heart-felt plea: "I long to see the baby/I'll brave most anything/To make it to the manger/Give my gift to my King." I really enjoy the lyrics that fit nicely with the music (actually written first). My awesome friend, featured vocalist Jenny Smith, does a great job on the audio track of taking us through the emotions of getting to Christ and giving Him (as the late Neal A. Maxwell said) the only thing that's truly ours to give: our will. 2009: The response to this song has been fabulous, thanks for your kind emails singing its praises.